Before :- P.P. Naolekar and Markandey Katju, JJ. Criminal Appeal No. 179 of 2008. D/d. 24.1.2008. For the Appellant :- Harish N. Salve, Sidharth Luthra and Mr. Mukul Rohtagi, Sr. Adv. with Sandeep Kapur, Ruchin Midha, R.N. Karanjawala and Manik Karanjawala, Advocates. For the Respondent :- A. Sharan, ASG with A. Mariarputham and B. Krishna Prasad, Advocates. Satwant Singh Sawhney v. D. Ramarathnam, Asstt. Passport Officer, (1967)3 SCR 525. Maneka Gandhi v. Union of India, (1978)1 SCC 248. Damji Valaji Shah v. L.I.C. of India [AIR 1966 SC 135]. Gobind Sugar Mills Ltd. v. State of Bihar [1999(7) SCC 76]. Belsund Sugar Co. Ltd. v. State of Bihar [AIR 1999 SC 3125]. State of Orissa v. Binapani Dei [AIR 1967 SC 1269]. 2. The appellant claims to be a non-resident Indian settled in United Kingdom for the last 2 3 years. The passport of the appellant as well as other documents were seized by the respondent from 4, Prithviraj Road, New Delhi in a search conducted on 10.10.2006 when the appellant was on a visit to India. The said search and seizure was pursuant to an F.I.R. dated 9.10.2006 registered on the basis of a sting operation carried out by a news portal in the year 2001. The passport seized during the search was retained by the C.B.I. officials. An application was moved by the appellant before the Special Judge, C.B.I., Patiala House Courts, New Delhi praying for release of his passport so that he can travel abroad to London and Dubai for a period of 15 days. The learned Special Judge, by order dated 15.1.2007, directed the release of the passport to the appellant by imposing upon him certain conditions. Aggrieved against the order passed by the learned Special Judge, C.B.I., the respondent preferred a Criminal Revision before the High Court. The High Court, by order dated 5.2.2007, reversed the order of the learned Special Judge and refused to release the passport to the appellant. Aggrieved against the order of the High Court, present appeal, by special leave, has been preferred by the appellant. (e) if proceedings in respect of an offence alleged to have been committed by the holder of the passport or travel document are pending before a criminal court in India:"
Reference was also made to Section 10A of the Act which has been introduced by Act 17/2002 w.e.f. 17.10.2001 . "31 : For the reasons mentioned above, we would accept the view of Kerala, Bombay and Mysore High Courts in preference to that expressed by the Delhi High Court. It follows that under Article 21 of the Constitution no person can be deprived of his right to travel except according to procedure established by law. It is not disputed that no law was made by the State regulating or depriving persons of such a right." "....Now, it has been held by this Court in Satwant Singh's case (supra) that 'personal liberty' within the meaning of Article 21 includes within its ambit the right to go abroad and consequently no person can be deprived of this right except according to procedure prescribed by law. Prior to the enactment of the Passports Act, 1967, there was no law regulating the right of a person to go abroad and that was the reason why the order of the Passport Officer refusing to issue passport to the petitioner in Satwant Singh's case (supra) was struck down as invalid. It will be seen at once from the language of Article 21 that the protection it secures is a limited one. It safeguards the right to go abroad against executive interference which is not supported by law; and law here means 'enacted law' or 'State law' (Vide A.K. Gopalan's case). Thus, no person can be deprived of his right to go abroad unless there is a law made by the State prescribing the procedure for so depriving him and the deprivation is effected strictly in accordance with such procedure....."
6. On the other hand, learned Additional Solicitor General appearing for the respondent submitted that the passport was seized and impounded by exercising the powers under Section 102 read with Sections 165 and 104 of Code of Criminal Procedure (hereinafter referred to as "the Cr.P.C."). He further contended that the power to retain and impound the passport has been rightly exercised by the respondent as there is an order dated 3.11.2006 passed by the learned Special Judge for C.B.I. exercising the power under Section 104 of Cr.P.C. 7. Sub-section (3)(e) of Section 10 of the Act provides for impounding of a passport if proceedings in respect of an offence alleged to have been committed by the holder of the passport or travel document are pending before a criminal court in India. Thus, the Passport Authority has the power to impound the passport under the Act. Section 102 of Cr.P.C. gives powers to the police officer to seize any property which may be alleged or suspected to have been stolen or which may be found under circumstances which create suspicion of the commission of any offence. Sub-section (5) of Section 165 of Cr.P.C. provides that the copies of record made under sub-section (1) or sub-section (3) shall forthwith be sent to the nearest Magistrate empowered to take cognizance to the offence whereas Section 104 of Cr.P.C. authorizes the court to impound any document or thing produced before it under the Code. Section 165 of Cr.P.C. does not speak about the passport which has been searched and seized as in the present case. It does not speak about the documents found in search, but copies of the records prepared under sub-section (1) and sub- section (3). "Impound" means to keep in custody of the law. There must be some distinct action which will show that documents or things have been impounded. According to the Oxford Dictionary "impound" means to take legal or formal possession. In the present case, the passport of the appellant is in possession of CBI right from the date it has been seized by the CBI. When we read Section 104 of Cr.P.C. and Section 10 of the Act together, under Cr.P.C., the Court is empowered to impound any document or thing produced before it whereas the Act speaks specifically of impounding of the passport. 8. Thus, the Act is a special Act relating to a matter of passport, whereas Section 104 of the Cr.P.C. authorizes the Court to impound document or thing produced before it. Where there is a special Act dealing with specific subject, resort should be had to that Act instead of general Act providing for the matter connected with the specific Act. As the Passports Act is a special act, the rule that "general provision should yield to the specific provision" is to be applied. See : Damji Valaji Shah & another v. L.I.C. of India & others [AIR 1966 SC 135]; Gobind Sugar Mills Ltd. v. State of Bihar & others [1999(7) SCC 76]; and Belsund Sugar Co. Ltd. v. State of Bihar and others [AIR 1999 SC 3125]. 9. The Act being a specific Act whereas Section 104 of Cr.P.C. is a general provision for impounding any document or thing, it shall prevail over that Section in the Cr.P.C. as regards the passport. Thus, by necessary implication, the power of Court to impound any document or thing produced before it would exclude passport. 10. In the present case, no steps have been taken under Section 10 of the Act which provides for variation, impounding and revocation of the passports and travel documents. Section 10A of the Act which provides for an order to suspend with immediate effect any passport or travel document; such other appropriate order which may have the effect of rendering any passport or travel document invalid, for a period not exceeding four weeks, if the Central Government or any designated officer on its satisfaction holds that it is necessary in public interest to do without prejudice to the generality of the provisions contained in Section 10 by approaching the Central Government or any designated officer. Therefore, it appears that the passport of the appellant cannot be impounded except by the Passport Authority in accordance with law. 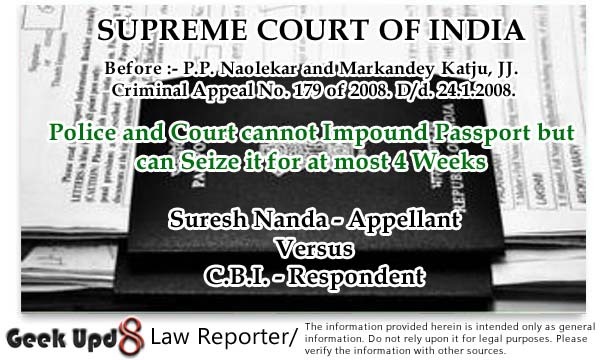 The retention of the passport by the respondent (CBI) has not been done in conformity with the provisions of law as there is no order of the passport authorities under Section 10(3)(e) or by the Central Government or any designated officer under Section 10A of the Act to impound the passport by the respondent exercising the powers vested under the Act. "Power of police officer to seize certain property : (1) Any police officer may seize any property which may be alleged or suspected to have been stolen, or which may be found under circumstances which create suspicion of the commission of any offence". In our opinion, while the police may have the power to seize a passport under Section 102(1) Cr.P.C, it does not have the power to impound the same. Impounding of a passport can only be done by the passport authority under Section 10(3) of the Passports Act, 1967. 12. It may be mentioned that there is a difference between seizing of a document and impounding a document. A seizure is made at a particular moment when a person or authority takes into his possession some property which was earlier not in his possession. Thus, seizure is done at a particular moment of time. However, if after seizing of a property or document the said property or document is retained for some period of time, then such retention amounts to impounding of the property/or document. In the Law Lexicon by P. Ramanath a Aiyar (2nd Edition), the word "impound" has been defined to mean "to take possession of a document or thing for being held in custody in accordance with law". Thus, the word "impounding" really means retention of possession of a good or a document which has been seized. 13. Hence, while the police may have power to seize a passport under Section 102 Cr.P.C. if it is permissible within the authority given under Section 102 of Cr.P.C., it does not have power to retain or impound the same, because that can only be done by the passport authority under Section 10(3) of the Passports Act. Hence, if the police seizes a passport (which it has power to do under Section 102 Cr.P.C. ), thereafter the police must send it along with a letter to the passport authority clearly stating that the seized passport deserves to be impounded for one of the reasons mentioned in Section 10(3) of the Act. It is thereafter the passport authority to decide whether to impound the passport or not. Since impounding of a passport has civil consequences, the passport authority must give an opportunity of hearing to the person concerned before impounding his passport. It is well settled that any opportunity of hearing to a party vide State of Orissa v. Binapani Dei [AIR 1967 SC 1269]. 14. In the present case, neither the passport authority passed any order of impounding nor was any opportunity of hearing given to the appellant by the passport authority for impounding the document. It was only the CBI authority which has retained possession of the passport (which in substance amounts to impounding it) from October, 2006. In our opinion, this was clearly illegal. Under Section 10A of the Act retention by the Central Government can only be for four weeks. Thereafter it can only be retained by an order of the Passport authority under Section 10(3). 15. In our opinion, even the Court cannot impound a passport. Though, no doubt, Section 104 Cr.P.C. states that the Court may, if it thinks fit, impound any document or thing produced before it, in our opinion, this provision will only enable the Court to impound any document or thing other than a passport. This is because impounding a "passport" is provided for in Section 10(3) of the Passports Act. The Passports Act is a special law while the Cr.P.C. is a general law. It is well settled that the special law prevails over the general law vide G.P. Singh's Principles of Statutory Interpretation (9 th Edition pg. 133). This principle is expressed in the maxim "Generalia specialibus non derogant". Hence, impounding of a passport cannot be done by the Court under Section 104 Cr.P.C. though it can impound any other document or thing. 16. For the aforesaid reasons, we set aside the impugned order of the High Court and direct the respondent to hand over the passport to the appellant within a week from today. However, it shall be open to the respondent to approach the Passport Authorities under Section 10 or the authorities under Section 10A of the Act for impounding the passport of the appellant in accordance with law. 17. We, however, make it clear that we are not expressing any opinion on the merits of the case and are not deciding whether the passport can be impounded as a condition for grant of bail. 18. The appeal stands disposed of accordingly.